There’s nothing better than waking up to beautiful skin. Ok, maybe there are better things, but being happy with your skin ranks pretty high on my list of awesome. Unfortunately, I’m not blessed with perfect skin so I have to work on it and it’s quite a journey, trying to find products that keep my skin looking its best. Below are a some products that I have started using and fallen absolutely in love with as they’ve kept my skin clean, clear and glowing! 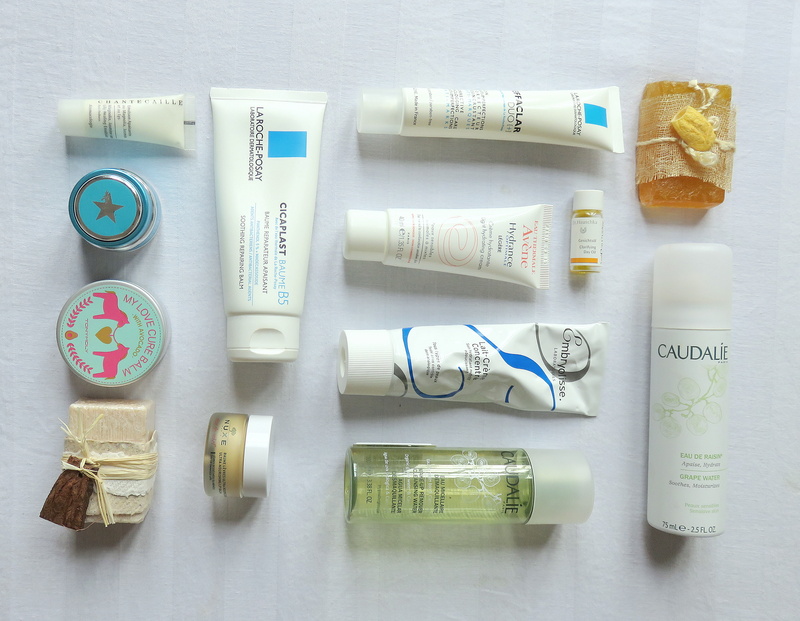 For a definitive list of my all-time favourite skincare products, check out my Skincare 101 blog post. Using bird poop to clean your face?! Not a chance! Don’t be put off by the less-than-enticing product name; it’s called ‘bird’s dropping’ because one of the cleanser’s main ingredients is an enzyme that’s found in lark poop and papaya. Thankfully, in this cleanser the enzyme is extracted from papaya so it’s safe for your face. One of the reasons I bought this was because of the papaya enzyme extract, which is also found in my fave cleanser by Mario Badescu (Enzyme Cleansing Gel), so I knew it had to be good. It’s self foaming, so you only need to use a little and it’s so gentle on skin and doesn’t leave it feeling dry or tight. I bought this in KL for my Europe trip as I wanted something that would be hydrating yet with blemish control, and with AHA (alpha hydroxy acid) and BHA (salicylic acid) this ticks both of those boxes. Another reason I bought this was that it is manufactured by the same parent company that makes my favourite lip balm so I knew they made quality products (and it’s Japanese and we know they make the best skincare). This cleanser is soooo good! It really does clean deep down, as the chemicals gently exfoliate your dead skin and it leaves your skin glowing and baby soft. I highly recommend for girls with combination skin and sensitive acne/blemish prone skin. I bought this after watching a video by my fave beauty blogger Esteé Lalonde, who raved about how good this product was. This is hands down one of the best micellar waters I’ve used, and yes, it’s even better than Bioderma, which I actually don’t rate at all (hate me all you want). I love the packaging of this product, and the formula is just so good and cleans every inch of make-up and other stuff off your skin. I like using this even if I’m not wearing make-up, just to really get all the grime and dirt off my face. I will definitely be using this as my go-to make-up remover from now on. It is a truth universally acknowledge by every beauty editor, blogger, and female on this earth that La Roche Posay is one of the best skincare companies ever. So it comes as no surprise that this product is the bomb, that I think it’s going to make the list of all-time fave products! The Effaclar Duo + claims to unclog pores and improve skin texture – and it does just that. I have used this for almost two months now and I can confidently say my skin has improved significantly, and that’s an understatement. My breakouts are minimal (mainly hormonal) and the scarring on my cheeks has reduced noticeably. I think if you use this over a skin-refining serum, you’ll see so much more improvement. I highly recommend for anyone wanting to have better skin. Avene is known for making some of the most gentlest, effective skincare products, and this one doesn’t disappoint. I bought this for European winter and it worked perfectly to keep my skin hydrated; and I actually still use this now as a night cream, over a serum, to seal in the product and give my skin an extra moisture boost. I love this cream, and I love waking up and seeing my skin look so radiant! I wish they sold them in bigger tubes as it feels so good to slather tons of this cream on my face and neck before bed. This is going to be a repeat purchase and a staple of my night time skincare routine. I’ve never used Dr Hauchska products before and I bought this while on holidays as I had a persistent pimple right in the middle of my face, that would not go away. It has a great list of ingredients (neem extract, calendula extract, apricot kernel oil and almond oil to name a few) but unfortunately, this didn’t help either at the time, only because, as I have recently discovered, I was using it wrong. I have oily skin, and with the weather currently soaring to a humid 44 degrees my skin was just getting more oilier and angry. The thought of putting this on my face during the day was terrifying, so I used it at night instead and voila! My skin started to clear up. I don’t know if I would buy this again, but I would recommend it for those who are suffering persistent breakouts and aren’t afraid to use oil to clear up your skin.